In an effort to minimize land and water pollution in its host community of its Batangas Terminal, Chevron Philippines Inc. (CPI), through its Caltex brand, launched an environmental awareness program hinged on the ecology projects proposed by student-and-teacher teams in San Pascual, Batangas. The program, named Caltex Eco(logy is) Me or Caltex Eco Me, attracted 30 project proposals from student-and-teacher teams of San Pascual National High School, the municipality’s biggest high school in terms of student population. Program partner American Chamber Foundation Inc. (ACF) chose three finalists for implementation in three barangays adjacent to waterways leading to the San Pascual coastline. Team Flower in a Bottle, composed of 50 students and at least 2 teachers, scored the most points for highest impact and strongest sustainable component. The team received P1 million worth of technical-vocational materials including audio-visual equipment, sewing machines, and even hand and foot massage and spa sets which were on the winners’ wish list for their donation to their school. The team stood out as it reinforced the existing waste management program of Barangay Laurel through an ingenious method of turning reusable and recyclable plastic bottle caps to decorative flowers. “One of the best incentives of this ecology contest is that Caltex empowered my students not only to bring waste management awareness in their own communities but also to enable them to become donors to their own school. These prizes are our team’s contribution and legacy to the current and succeeding classes of San Pascual National High School. We want all the students to remember our cause when they see and use these educational materials from Caltex,” Ermelinda Ilagan, the teacher/adviser of Team Flower in a Bottle, said during the Caltex Eco Me awarding ceremony. Caltex Eco Me was fueled by auction proceeds from the Caltex Partners’ Day event held last March that included Caltex retailers, customers and various business partners. Herma Group of Companies Chaiman Herminio Esguerra, who won the auction’s highest bid for a vintage Caltex gas pump-style refrigerator, joined the Chevron leaders during the Eco Me awarding ceremony at the Chevron Batangas Terminal. 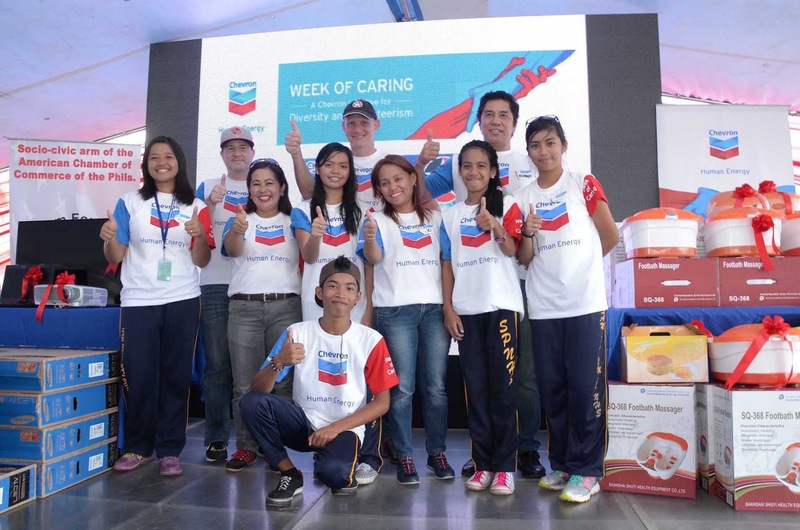 The Caltex Eco Me awards was held as the culminating activity of Chevron’s annual coastal clean-up activity for its Week of Caring 2015, a week-long volunteerism activity when employees and business partners serve communities where CPI operates and engage in activities that benefit disadvantaged communities. Joseph Bronfman, CPI’s Area Business Manager for Finished Lubricants, praised the participating teams. “These children who showed enthusiasm in keeping and preserving the environment deserve these educational items from the Eco Me program,” he said. “Caltex Eco Me is a proactive program in addressing our environmental issues. It is our hope that as more and more of our communities become aware of the importance of waste management, we will soon see the day when we no longer need coastal cleanups,” said Peter Morris, CPI’s General Manager for Philippine products.